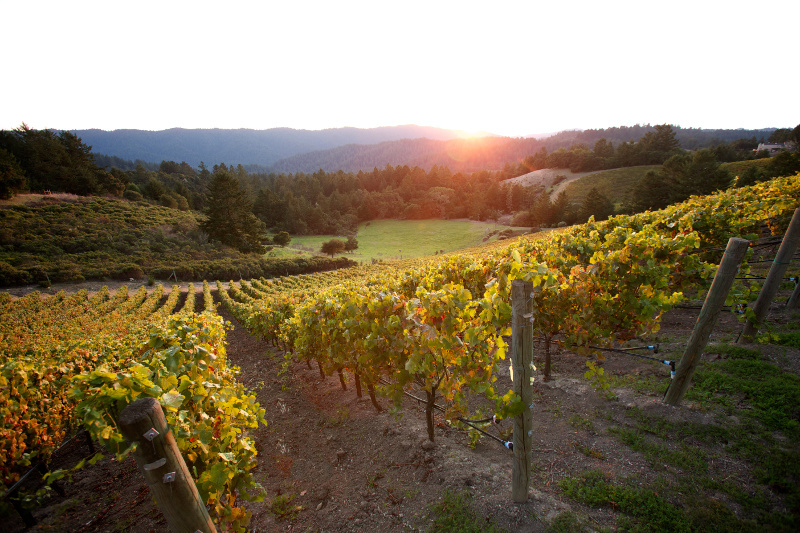 Welcome to the Fall 2014 newsletter from Rhys Vineyards! These are very exciting times at Rhys! After years of fighting low yields and difficult vintage conditions, we have now experienced a trio of vintages (2012-2014) with good yields, great weather and outstanding quality. At the end of our 2012 harvest it was easy to think, “Wow, we may never again see quality this high with good quantities!” but 2012 was quickly followed by the generous and equally high quality 2013 vintage. Production in 2014 is only moderate in size but again quality looks to be exceptional. Sunset over Alpine after the 2012 harvest. The 2012 vintage could be described as the perfectly average and benign California vintage. Of course “perfectly average” weather through an entire season is quite rare! 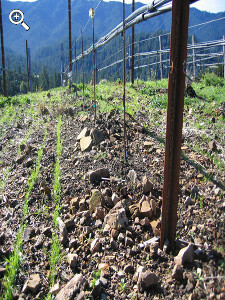 The vintage started with dry soil conditions which often produce wines with good concentration. The spring was uneventful and, most importantly, lacked the frost pressure that can reduce our potential crop. As the vines began flowering it became clear that they were trying hard to produce a large crop after the miniscule yields in 2011. In fact, across California excessive yields would turn out to be the one flaw in an otherwise perfect 2012 vintage. Fortunately for Rhys, our naturally low-yielding mountain sites did not over-produce. 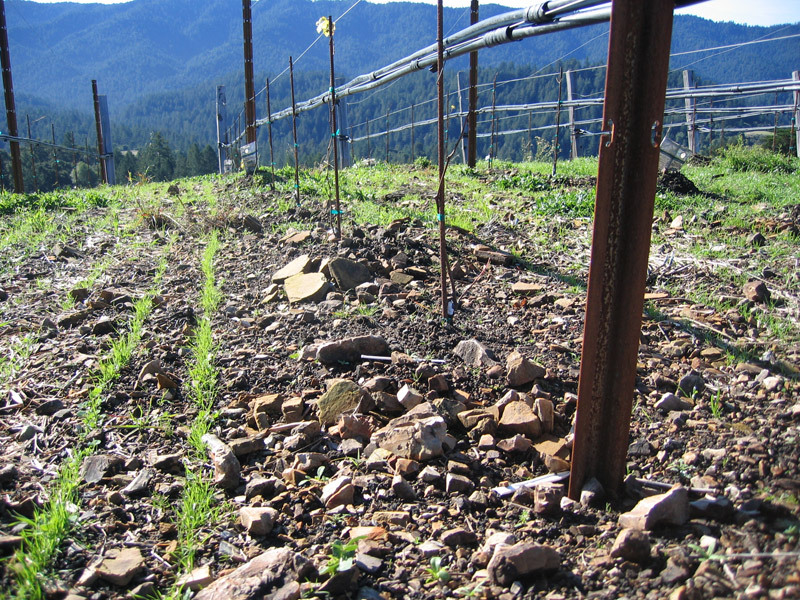 Instead, for the first time, production at Alpine and Horseshoe reached an ideal, moderate level of just 2½ to 3 tons per acre. 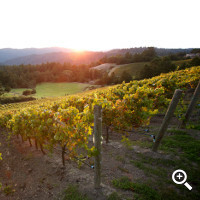 Each season there are two critical periods in the northern Santa Cruz Mountains. The first is the weather preceding and during flowering. In 2012, this period was mild to slightly warm. These benign conditions allowed our vines to set the best crop we have seen to date. The second and most critical determinant of quality is the harvest weather. Each year we hope for mild weather preceding harvest as this allows grapes to accumulate intense flavors while retaining natural balance and low sugars. Mild harvest weather, and the slowly ripening grapes that come with it, makes it much easier to pick our grapes at the perfect moment in their development. In recent years it has become common for September to be the warmest month of our season but fortunately September 2012 did not follow this alarming trend and we experienced a perfect, mild September. Interbedded Shale and Limestone at Horseshoe. 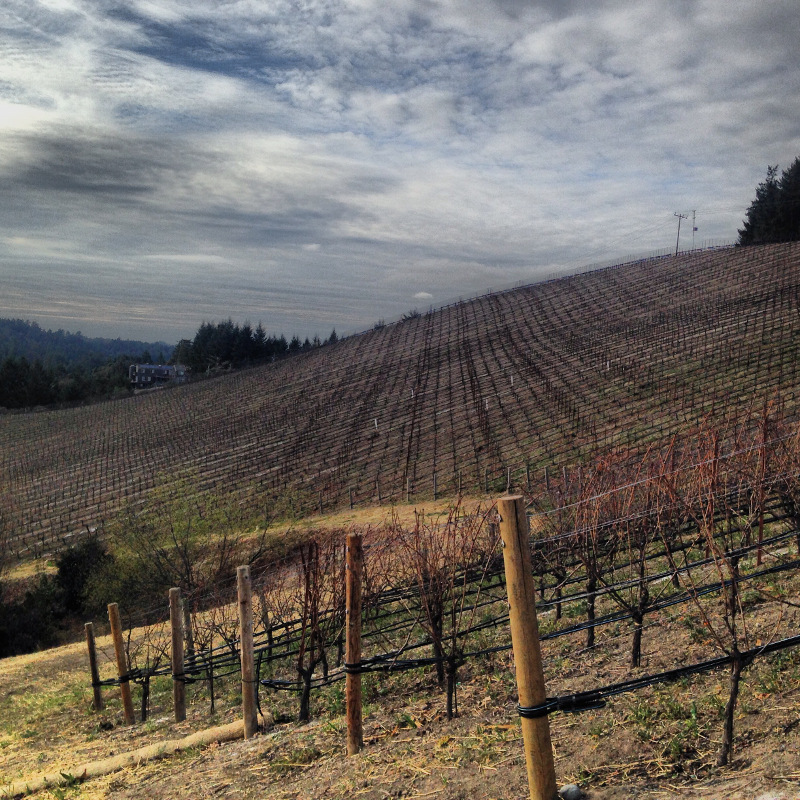 The best description of our 2012 Pinot Noirs would be “ripe, vibrant and perfectly balanced”. The wines are uniformly charming, intense middleweights with the best acidity we have seen. These are Pinots that will have a very long drinking window as many will drink well while young and all will improve for many years. The 2012 Chardonnays are particularly precise and refreshing. Unlike the Pinots, these Chardonnays may require more patience than a typical vintage but patient customers will be rewarded with exciting, mineral-driven wines of both grace and power. The ’12 San Mateo marries the early appeal of our Family Farm Vineyard with the depth and complexity of fruit from our Alpine and Horseshoe mountain vineyards. The result is a beautiful, charming and complex Pinot that will always drink well. With quality approaching that of our vineyard designates, this is probably the best value in estate Pinot Noir that we have offered. Family Farm continues to impress in 2012 with charming red fruit, pronounced loam and stalky complexity. The 2012 is especially precise and fresh. This is a terrific Pinot Noir that will drink well on release and for a decade or more afterwards. 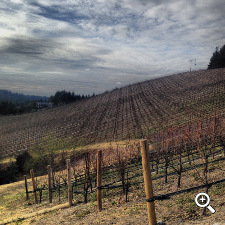 This Home vineyard Pinot Noir shows the typically firm red fruit, tension and complexity of this unique site. The 2012 bottling is a vibrant middleweight and is exceptionally “Burgundian” in character. Until the ’13 and ’14 can rival it, we feel the ’12 Alpine is our greatest Alpine bottling to date. As these struggling hillside vines have matured, the fruit has become more red and complex but still exhibits the intensity that people love. Don’t miss this one. This Alpine Chardonnay is typically complex and intense but the 2012 bottling is possibly the most refreshing and precise bottling of this wine to date. It may require a bit of patience but shows terrific potential. The cool 2011 vintage left an indelible impression on this wine. The cool, peppery character of the vintage, allied with the site’s rocky complexity, makes for an extremely exciting and age worthy Syrah from one of our very best vineyards. Coming this fall from Rhys! A cloudy winter day over Alpine. Both of these wines have rounded out nicely in bottle and we think they offer exceptionally good value. Also, please be on the lookout for our 2013 Futures offering. After the incredible response to the 2012 Futures, we are very excited to be able to offer Futures again for the larger production 2013 wines. Like the last time this is an offering for customers looking to buy case quantities or non-standard (375ml, 500ml, magnum or 3 Liter) bottles of our wines. The standard release of 2013s will be offered this time next year.